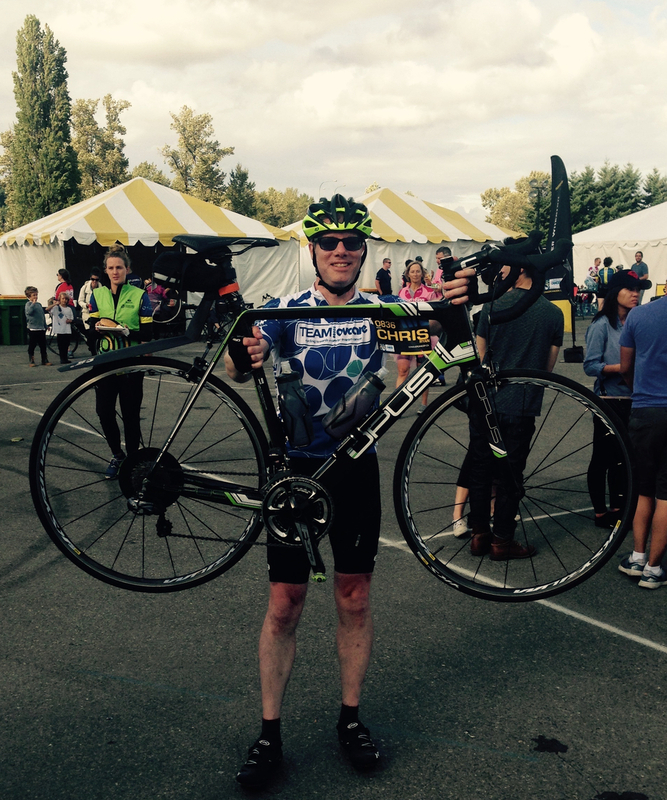 Last weekend, I cycled from Vancouver to Seattle—well, actually Surrey to Redmond, with a bit of a gap in the middle—in support of the BC Cancer Foundation. It was my first year doing the Ride to Conquer Cancer, and I was well-prepared: I’ve been cycling for years but I trained hard for this event, participating in a number of 70-90km team rides. A couple of weeks before the event I got an amazing new bike, which seemed to make cycling effortless. But the real story was the weather. Apparently the Ride was moved from June as it had been raining that month consistently for several years. But as the last weekend in August approached, it became clear that we would see the first real rain in months. So I was ready for a slog through the wet. And at the start, at the Cloverdale Rodeo & Exhibition Fairgrounds, it certainly was raining. With over 2000 cyclists participating, the first few kilometres were slow, and I started to get a bit cold. But once we arrived at the border, the rain stopped, and it was almost completely dry for the remainder of the two-day trip. The first day, there was an optional “Challenge” route, and partly on the prompting of friends, I chose to give it a shot. Just south of the Peace Arch, I swung East. I heard that only something like 60-100 people tackled the Challenge route this year. 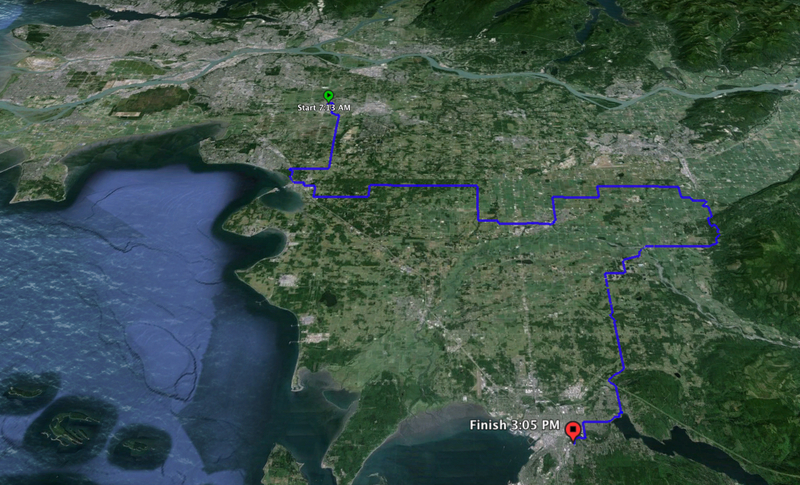 The whole ride was very well supported, but there was one stretch on this route, about 60km, between pit stops. At times I cycled with others; other times I cycled alone. I took off my rain jacket and enjoyed the day. As this was a ride for cancer research, I thought about my mother, who died of cancer in 2007. Somewhere south of Sumas, heading up some long, brutal hills and into the trees, there was a fair amount of debris on the road. I pressed on alone and somewhere past Everson, cycling into the gusting wind started to be an ordeal. I met up with about ten other riders and we headed south along Noon Road. Battered by the wind and at risk of being blown into the ditch or into a car, we stopped. It was so gusty that at times it was hard to stand and hold onto our bikes. We huddled in the ditch for about an hour, and a county sheriff stopped by to check in on us. Support crew started picking up some of us to take us on to where the Challenge and “Classic” routes met up for lunch. But we’d set out to ride to Seattle, and we didn’t want to miss more of the ride than we had to, so a few of us decided to press on to Bellingham. From there, we were shuttled down to the Mount Vernon camp. I was disappointed not to have cycled the whole way, but I got in 113km. It rained overnight, and after a bit of a restless sleep—my tent neighbours were partying pretty hard—the sky cleared and we set off again. I awoke to see on my iPhone the news of Oliver Sacks‘ death from liver cancer, and resolved to cycle in his memory. Everyone cycled the same route on the second day. It was a bit longer than planned, due to detours because of the storm the previous day. We passed some flattened corn fields south of Mount Vernon. It was a more social day, which was enjoyable. There was one segment along a beautiful paved path through the woods. Sadly, during the ride I received an email informing me that a relative was in the final stages of terminal cancer. So the second day was a reminder of why we were all riding. I did almost 137km on the second day. We reached Redmond in the late afternoon and my daughter picked me up; I’m glad I didn’t have to pile into a shuttle and head back to Surrey. The only downside was some scratches on my beloved new bike from the Bellingham to Mount Vernon transport. Overall it was a great experience, including the adventure-by-weather. I’m really grateful to everyone who helped get me to the minimum $2500 fundraising goal. 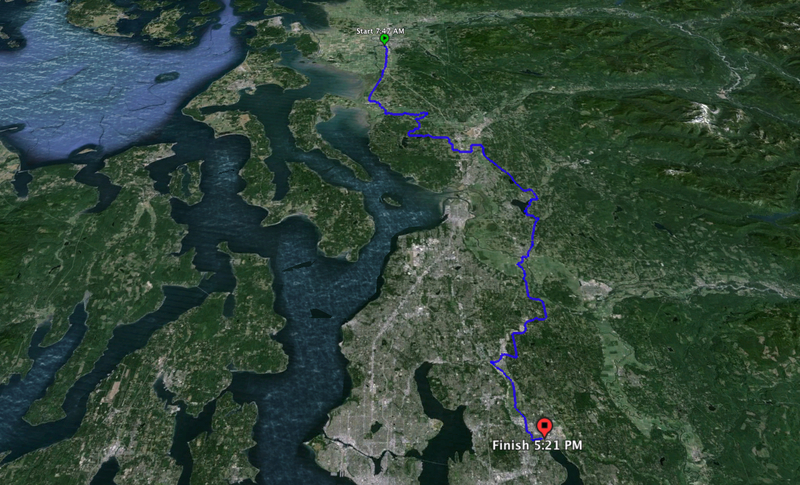 I now have a bit of a bug for long-distance cycling, and I may even consider doing this one again. It’s a good cause, and there is a lot of enjoyable camaraderie. But probably my favourite part of the journey was the Saturday morning, riding alone through Washington State farmland in the unexpected dry, before the wind picked up. Far away under my own power in the quiet, alive.